RemoBell from Olive & Dove Inc., was on display at ShowStoppers@CES 2017. Their sales team provided a unit to me to evaluate. 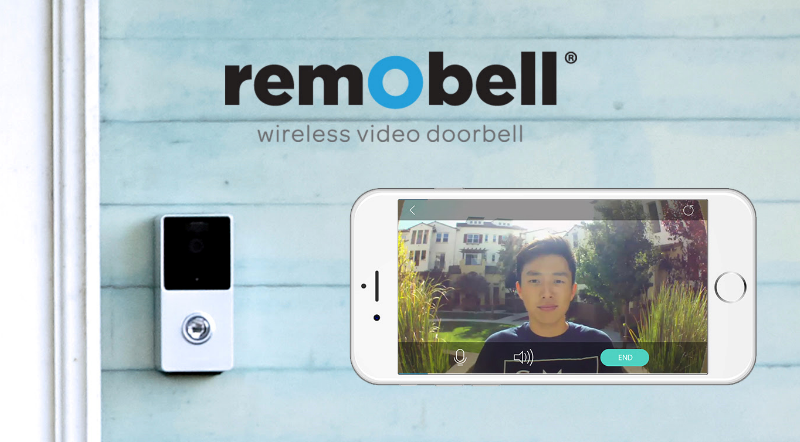 RemoBell is a weatherproof, wireless video doorbell that syncs to your mobile app, enables you to see and talk to your visitors from your smartphone from wherever you may be. When a visitor is at your door, RemoBell sends a push notification and live high definition (720p) video feed to your phone which allows you to see and communicate (2 way audio) with your visitors in real time. You are alerted anytime someone is at your door. In addition to realtime notifications, the app provides an activity log that displays every event (date/time) that was motion was detected and provides cloud storage of the video so that you can watch recorded videos regardless of whether or not you answered the door. RemoBell has an infrared detector that senses body heat and alerts you when there is motion at your door, even if the doorbell did not ring. Infrared night vision allows you to see motion and answer the door day or night. Up to five additional family members can access RemoBell from their smartphones using the same account and login information. The RemoBell app allows you to check the battery status (6 rechargeable AA batteries are provided) and receive notification when the batteries are low and need to be charged or replaced. It provides up to four months of battery life between charges. Setup was extremely easy and quick – I installed RemoBell and was able to answer my door from my phone in less than 20 minutes. After you download the app, their on screen installation instructions walk you through the steps to set up an account, connect the doorbell to your 2.4 GHz WiFi wireless router, install the bracket at your door (four screws), and place the RemoBell into the bracket and secure it with a security screw. If the RemoBell is ever stolen, Olive & Dove provide a theft guarantee to replace it. I am impressed with the quality of the doorbell and its features. There is a second or two delay between the time the doorbell button is pushed and the time the notification arrives to your smartphone, but that does not cause any problems – it takes much longer to physically answer your door in person. Since the RemoBell is strictly a wireless device that syncs to your smartphone, it does not ring your home’s existing doorbell. I would have preferred the option to have RemoBell connect to my existing doorbell so that it would ring in conjunction with the push notification, but the ability to answer by door from anywhere and the security it provides by notifying me of any motion outweighs this minor inconvenience.